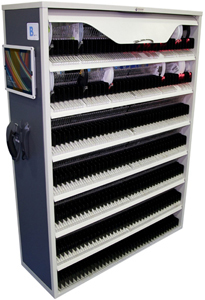 InoAuto Smart Mix part storage system. DEERFIELD BEACH, FL — February 2016 — Inovaxe, a provider of innovative material handling and inventory control systems, is now offering the InoAuto Smart Mix part storage system and the InoMSD cabinet. The storage systems enable parts to be organized and located quickly when needed. The InoAuto Smart Mix cart stores up to 480 8mm (0.3in), 7in (17.8cm) reels and up to 160 8mm (0.3in), 13in (33cm) reels. It also contains a 42 x 15in (106.7 x 38cm) smart tray to store PCBs, waffle trays or bulk materials. One platform can accomodate multiple part sizes. The company also offers the InoAuto Two Bay, which stores 1,120 7in (17.8cm) reels, and the InoAuto Single Bay, which stores 560 reels of the same size. All the Smart systems ae equipped with sensors and LED indicator lights, along with the company's locator software. The operator simply scans the barecode of the part and places it in an empty slot. The machine then reports the position of the part to its database. According to the company, its storage system allow the user to find a part in less than four seconds, and will return a part in less than eight seconds. The system promises to reduce material handling time by more than 70 percent, reduce reel storage space needed by 60 percent, travel time by 60 percent and increase inventory accuracy and operator efficiency. The InnoMSD cart is a solution for managing moisture-sensitive devices. It has an individual cell design which stores multiple reel sizes and waffle trays. Included with each system is the InoMSD tracking and timing software, which starts a clock when parts are removed, calculates and reports when the part's MSD (moisture-sensitive devices) life is about to expire.